Do you desire rapid spiritual growth? Do you want to enter a deeper dimension of effective ministry without leaving home? Do you long to be involved in a ministry that shapes nations? Do you want to be free from the guilt of prayerlessness - permanently? Do you want to know practical steps of how to make it happen? Are you ready to be inspired, stretched, and changed? When the truths in this book are applied, these desires will be fulfilled; you will be ruined for the ordinary and never again think prayer is dull. This book proves that we are surrounded by opportunities to impact our world through powerful intercessory prayer. Intercession, Thrilling and Fulfilling spells out the price of obedience, but leaves us in no doubt that the rewards and fulfillment far outweigh that price - you become a history shaper and closer friend of Almighty God through intercessory prayer. 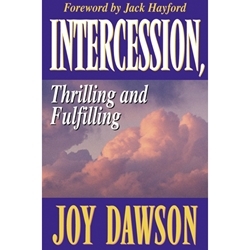 The most thorough and well explained (with tons of real life stories to encourage and God's Word to inspire) book on the ministry of intercession. Our family has devoured this book, taught from it, and passed it along to disciple others. If you are learning about intercession or a seasoned prayer warrior, this one is a must read.